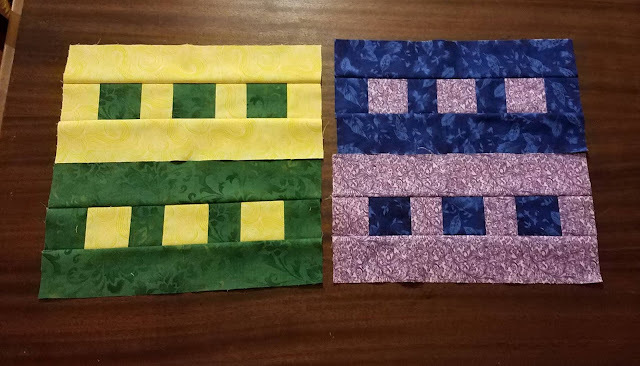 Another month, more fun blocks from my online quilting bees! First, Martha in Stash Bee asked for pineapple blocks. Not pineapples the traditional quilt block, actual pineapples! Aren't they super cute? Think you might enjoy an online bee? Stash Bee will start accepting sign-ups for 2019 on November 1st. is now accepting sign-ups for 2019! This is my third year in Stash Bee and I love it! I will be back for year 4 in 2019! Here is the direct link for 2019 information. In Bee Inspired, Queen Kate asked for a block she designed herself. You can make two of these blocks from just 2 strips of fabric, 2 1/2" by width of fabric! How cool is that? We set up our Queens so that October is the last month, leaving November free for those who need to catch up. That means these are my last blocks for this bee. Bee Inspired is currently a closed group, created by some of us who participated in the 2016 New Bloggers Blog Hop. We have decided not to operate as a bee for next year but we are discussing other activities and projects to keep the group going. I'm glad, because it's a great group of quilters!